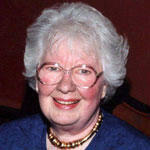 Mary Hoffman was program director of WOSU Radio in the days when WOSU-FM meant classical music at 89.7 on the dial. During my time here, I've inherited offices and files originating with Mary. Reading about her music programming and her views informing what makes a tremendous music station made for a wonderful education. Today, Classical 101 continues Mary's legacy through outstanding music programming, with informed and witty — if I do say so myself — on-air hosts. Elsewhere on our blog you'll find the Mary Hoffman Archive, featuring Mary's interviews with Maria Callas, Vladimir Horowitz and Joan Sutherland, to name a few. Check it out. Mary's voice comes home to WOSU Radio this Sunday afternoon. 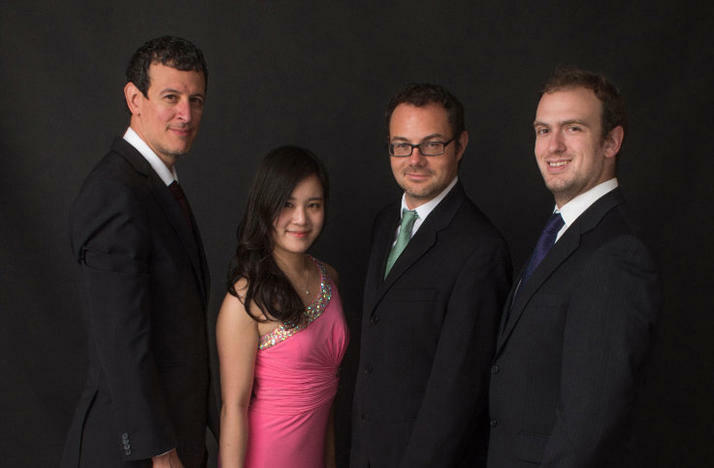 Music in Mid-Ohio, a weekly program dedicated to local-based music making, presents the Euclid Quartet performing Franz Joseph Haydn's The Seven Last Words of Christ. These meditations in music incorporate a spoken narration, featuring Mary front and center on stage with an internationally acclaimed string quartet. The Jefferson Academy of Music presented the performance in April at the Columbus Museum of Art, and Dave Gelfer recorded the concert. It was Dave who called me and said, "Listen, Mary did this incredible narration with the Euclid Quartet. You need to air this." Haydn (1732-1809) produced a few versions of The Seven Last Words of Christ. There's a gorgeous oratorio, with chorus, orchestra and vocal soloists, and there's a version for piano solo, both titled The Seven Last Words of Our Saviour on the Cross. What we'll hear Sunday is an adaptation for string quartet, based on the string parts in Haydn's choral version. The narration comes from Echoes from Calvary: Meditations on Franz Joseph Haydn's The Seven Last Words of Christ, edited by Richard Young, former violist of the Vermeer Quartet. Mary recently celebrated a significant birthday. Being a gentleman, I shan't reveal her age. I will say that if I live another 30 years, I doubt I'll be writing novels (Mary's latest is Apple of Sodom: An American Woman's Journey in Jordan). Tune in to hear the Euclid Quartet's performance of The Seven Last Words of Christ, featuring narration by Mary Hoffman, at 1 p.m. Sunday, July 23 on Classical 101's Music in Mid-Ohio. By the time she retired over 20 years later, Mary had interviewed many of the 20th century's finest musicians. Elsewhere on this blog you'll find Mary's interviews with Vladimir Horowitz, Maria Callas and Thomas Schippers. 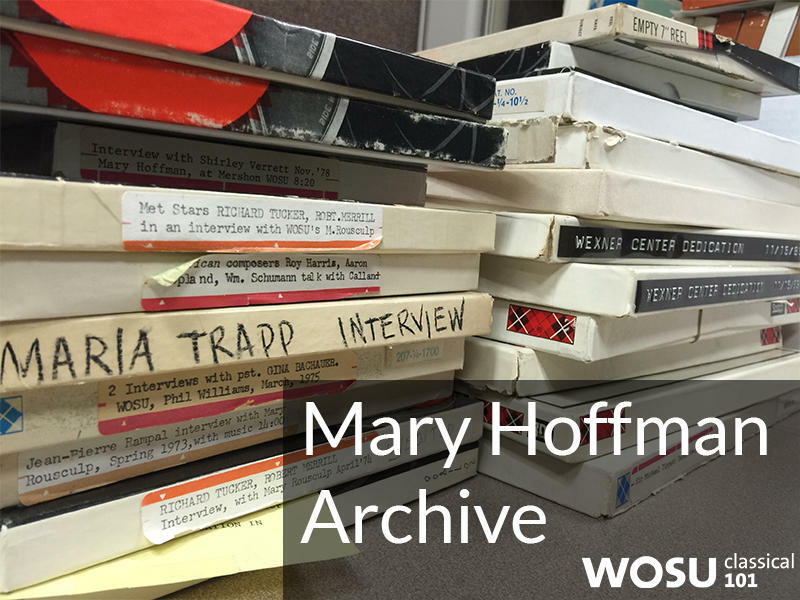 Mary Hoffman was long time Program Director and chatelaine of WOSU into the 1980s. Recently, Mary "downsized" and gave me a box of reel to reel tapes of all the interviews she'd done on the air going back to the late 1960s. Mary Hoffman became program director of WOSU-FM in 1966. Before her retirement thirty years later, Mary interviewed at length some of the greatest musicians of the 20th century.